Lately I’ve been playing a game of “Find the Celeriac.” Remember those oh-so-tiny celeriac seeds I shared on my instagram? Well, I had forgotten that their sprouts are quite tiny, too! I seeded two whole flats of these tiny seeds. Celeriac takes forever to germinate. Even knowing this, I was about to give up hope for them because 1. the seeds are old and 2. the trays ended up off the heat mat by mistake for their first several days. But suddenly, one day, I saw a few uniform-looking bright green *dots* on the flat. It was them! I was so glad. Can you spot the young sprout in this zoomed-in picture of six cells? A flat is roughly 12 of these six packs together. 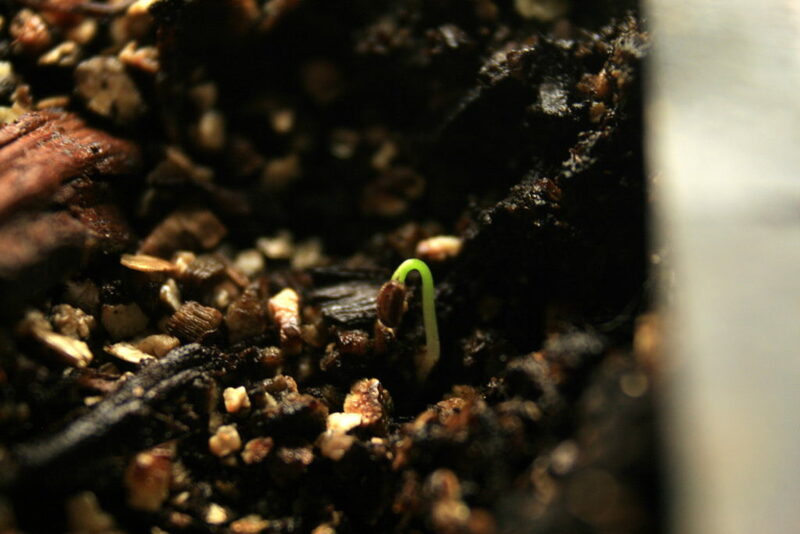 So, that’s a very, very tiny sprout my friends! Here’s the close-up of the above new sprout (located in the lower right corner of the photo). And here’s a close-up of a celeriac sprout fully open after shedding its seed husk. Spotting the sprouts isn’t usually the only trouble – identifying your intended seeds from the other weed-sprouts can bring some uncertainty to the task. 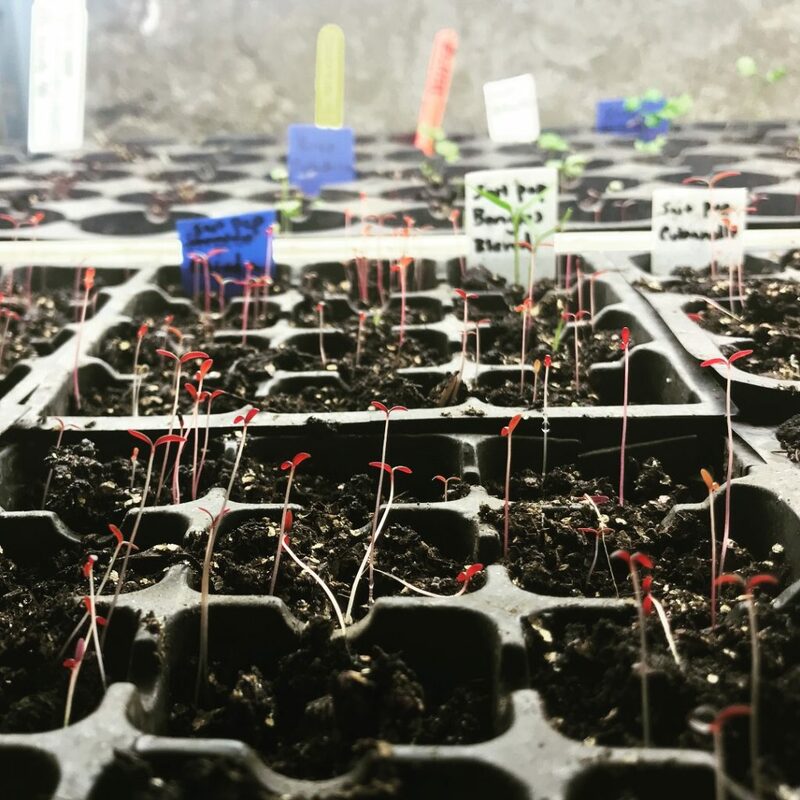 Store-bought growing medium is often sterilized, so you might not have to do much of this during your indoor seed-starting. It’s an essential part of sowing seeds outdoors, however. For myself, I mix my own growing medium without cooking it. This has never been a problem, but it can bring around some fun surprises! In this picture, all the red sprouts are “weed” sprouts, not the peppers I’m intending to grow here. I knew by the color and the heavy load of them that these sprouts must be amaranth. I have a mild obsession with red amaranth and let those giant deep red plants grow in every place all summer. 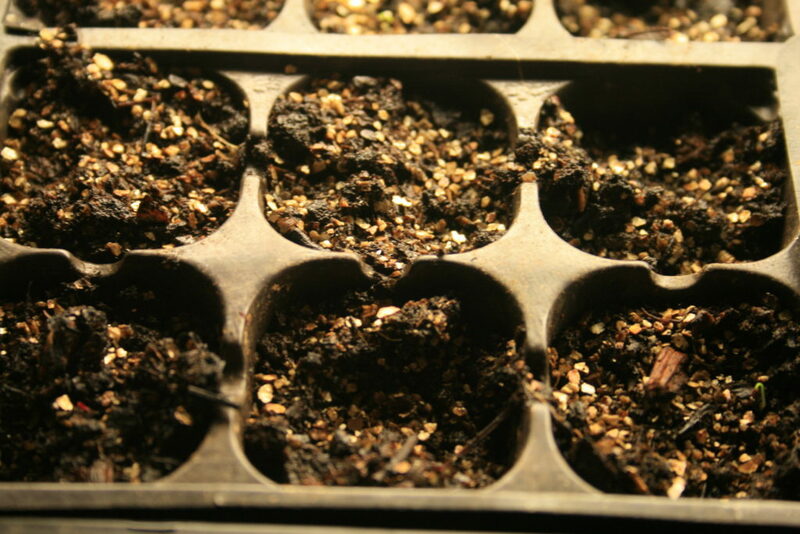 It was no surprise, then, that their seeds made it to my germination station via my compost! 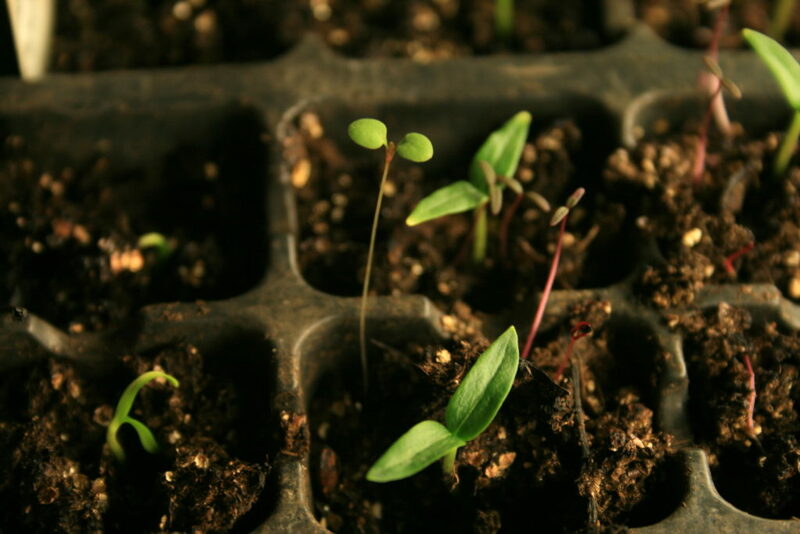 It’s necessary to cut back the weed sprouts so that the seeds you want to care for have all the space and all the nutrients. 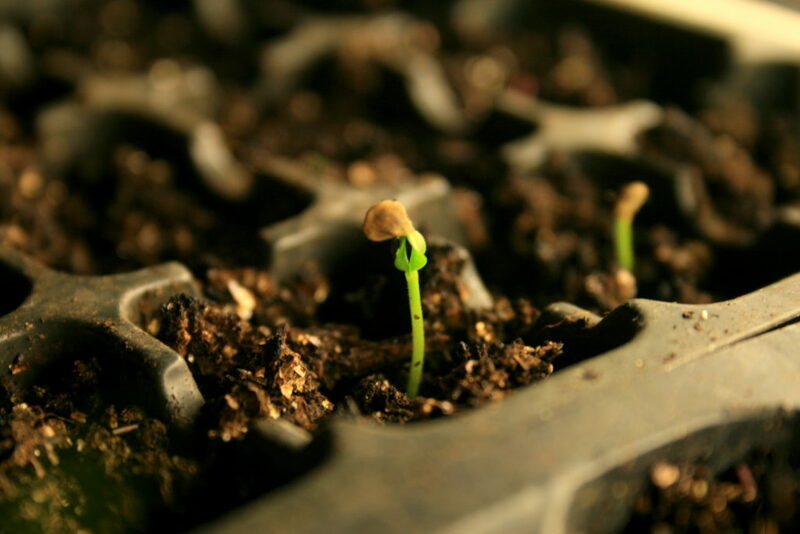 The more we garden, the easier identifying our seed sprouts will get. Here’s a few helpful things to look for when determining what to pull and what to keep. 1. 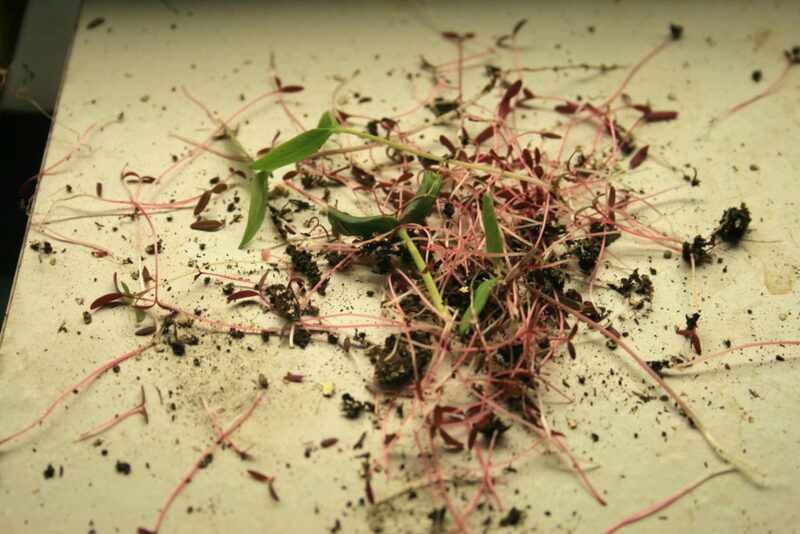 Observe any seed husks that are still attached to the plant. Here, if you remember the distinct look of a pepper seed, we can see that this sprout definitely belongs to some kind of pepper. The more you grow, the easier it will be to identify seeds. In any case, though, if the sprout still has the shell of a seed attached, keep it and let it grow. This method for identifying your sprouts becomes especially obvious if the sprouts are appearing in a solid row (assuming you planted in a row). In this picture, we can see two strong looking green sprouts, a random smaller green sprout and a few of those prolific red amaranth sprouts. It becomes clear that the solid green ones are the keepers and we can pull all the rest. This method for identifying will be easier with some experience under your belt. 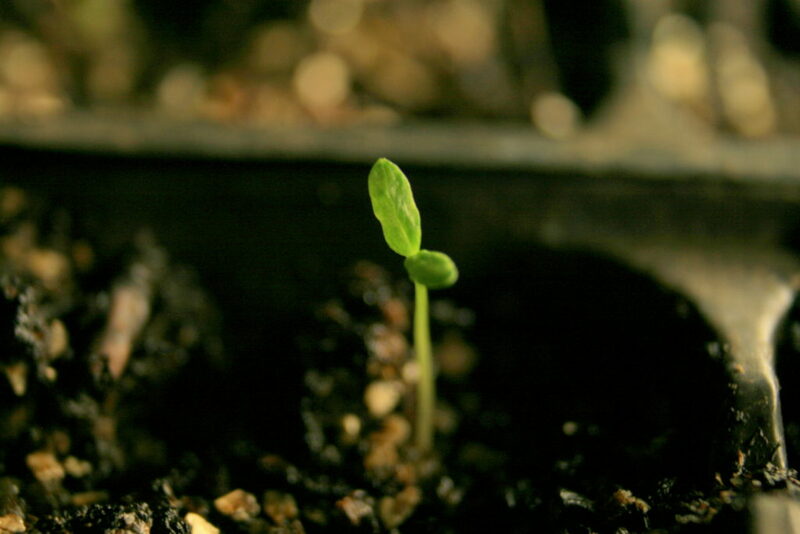 Soon, you’ll be able to identify what plant is growing simply based on the look of those initial leaves. Take note – not based on the leaf shape you might remember from the garden, but based on the shape of the cotelydon leaves. 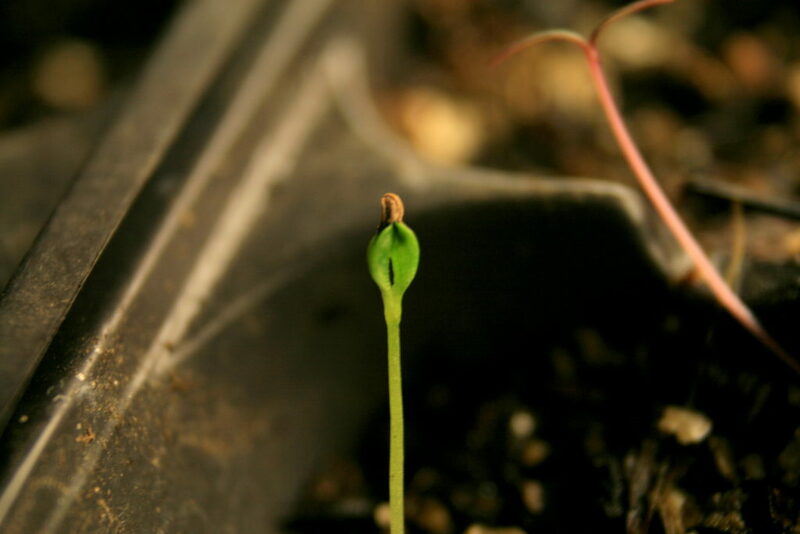 Those are the first leaves that the plant sprouts, and they can be vastly different in appearance from the plants’ true leaves. In this picture, I’m super familiar with the heart-shaped look of many brassica plants’ cotelydon leaves. I also recognize that the leaves on the right-hand side belong to something in the squash family. 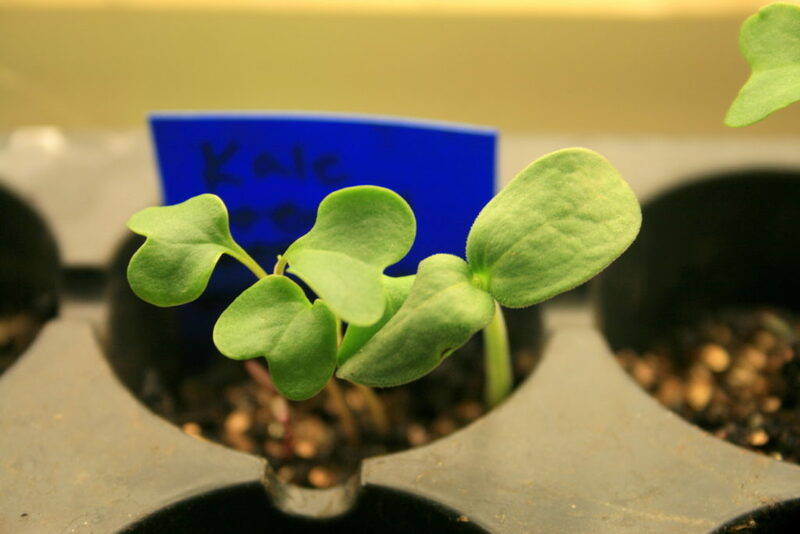 In this case, I had sown kale seeds, so I pull the squash sprout. Lastly, if you’re still not sure, I recommend leaving all alone and observing the sprouts until the more familiar true leaves appear. Out in the garden, watch close because those weeds can grow fast if you don’t get them when they’re small! Soon a kale leaf (or something familiar) will pop out, and things will be clear! I practice this on the regular with many “weeds” or volunteer plants in my garden. I often let things grow in my garden just to see what it is. I have a soft spot for those wildflowers, indeed. Halfway through cleaning up my seed flats, my pile of carnage looks like this. I actually find this task really calming and mindful. I can adore the little sprouts and be filled with wonder at the miracle of the seed as I go about pulling anything that doesn’t belong. What garden tasks have you been busy with? Wonderful! Best of luck in starting your new garden box. I hope it is a lot of fun for you.